After receiving a request from a reader, I am in the process of compiling a list of tips for new runners. Before posting my tips, I figured I should give you some insight into my running background (or lack of a running background). 🙂 I am definitely not a runner with a natural ability to kick some serious running booty, but by working at it and going out there and just running, I’ve built up the ability to tackle several miles without difficulty. Trust me when I say that back in 2007, I wasn’t sure if I could run an entire 5k without stopping (or puking!). So, without further ado, here’s my running story (with a few pictures thrown in so you don’t fall asleep)! When I graduated from college and entered the real world, I found myself a lot less busy than I was during my four years at UCF. During my senior year, I took a full load of classes, had a part-time internship, a part-time gig with student government and was actively involved in several clubs. I feel better and tend to thrive when I have a lot on my plate, so when I graduated and only had the commitment of a full-time job, I suddenly felt like I had a lot more free time. No homework? No meetings? What was I supposed to do? I felt like I needed a goal. I needed something to work toward. Throughout college, I worked out regularly, but was never a runner. I always admired those who could slip on a pair of sneakers and go out for a run like it was no big deal. I began looking into running races and on a whim I signed up for a 5k in August 2007 just to see if I could run 3.1 miles non-stop. My goal for my first 5k was to simply run the whole thing. When race-day came, I headed to the start line with my own personal running mantra for the day: “Just keep running. Run as slow as you want, but just keep running.” Knowing I could run as slow as I wanted, even if it meant that I was practically walking, made me feel less nervous. I managed to accomplish my goal and ran the entire thing. I even surprised myself by enjoying the experience. I loved the energy of the race and the camaraderie I felt with the other runners who shared a similar interest in fitness. When I saw that there was a half marathon at the beginning of December in Orlando, I immediately became interested. Could I do this? Could I really run 13.1 miles? I knew in my heart I finally found the goal I was looking for. Committing to running a half marathon would require lots of training, patience and time and I set out to find a training plan I thought I could follow. I found several training plans on Hal Higdon’s website and thought the Half Marathon Novice Training Plan seemed like a perfect fit. Since my goal for the half marathon was to simply run the whole thing and simply cross the finish line, this plan was ideal. It didn’t complicate training with speed drills, hills or anything that overwhelmed me. I veered from the training plan a bit, but followed it almost exactly when it came to the long runs. The only long run I missed was the 10 mile run the week before the race because I was sick and throwing up on the day I typically did my long run (Sundays). The longest run I did before the half was a nine-mile run, which made me a little nervous. The actual race distance was 4.1 miles more than that! I can honestly say his support and presence made a huge difference for me. Having a running buddy to tackle 13.1 miles with was motivating and made me feel like I wasn’t in it alone. I am happy to say we ran the entire half marathon together. When I crossed the finish line I felt proud and powerful, even though my body felt pretty weak! I will be starting my training for another half marathon (the Chicago Rock ‘n’ Roll Half Marathon) in June this year. I’m a little nervous because I haven’t run a half marathon, or a race longer than a 10k since 2007! I plan to approach my second round of training as I did my first: Run regularly, but run at an easy pace and enjoy the training process. I used to think of my lack of natural running ability as a setback, but now I look at it as a gift. Since I know I am not going to bust out a half marathon in 1:30, I don’t feel the pressure to run really fast. I allow myself to enjoy the running experience and run at a pace that is comfortable for me. Though I know many runners thrive on running fast and beating previous times, eliminating the pressure of running for time allows me to enjoy long runs and races. Are you a runner? Do you want to be a runner? What’s your running story? I’m signed up for the Chicago Rock n’ Roll half in August- is that they one you’re talking about? oh lord, i am too! 🙂 i’ve been outta the half-marathon loop for 2+ years! Loved reading this!! I’m thinking of doing the Philly Rock n Roll in September. I’ve been running off and on since I was 14, but I’ve just recently gotten into running for a GOAL…my first half is on Sunday!! I found your website through a google search and I love it! So awesome! Anyway, I started running about 4 months after my 3 baby was born, knowing I needed to lose some weight. The weight has come off (woohoo!) and I am still running. I love it! i just did my first 5k last week and ran the whole thing. I’m thinking of now training for a half and will check out your link. congrats on your first 5k. definitely keep me posted on the half marathon training if you decide to do it! Thanks for sharing. I enjoy reading about how other people find their way to running or any fitness related activity. I started running because I always thought it was something I couldn’t do. I turned those thoughts around and just got out there and did it. Now I love it. I get sick of it now and then, but I always come back to running when I need to clear my head. I WISH I was a runner. I wanna be. I reallllllly do. but, im just not sure I love it. I love that you did this, and I need to as well! Will get around to it! I trained by myself too for my first 1/2 marathon with Hal Higdon plan!!! i enjoy running but can definitely live without it 🙂 i don’t think i’ll ever run a race, but it’s always fun to get in a nice run! I definitely agree with your running advice to new runners! I started running over a year ago and in that time I have completed several half marathons and a full marathon. For new runners, the goal should just be to finish the race feeling good and strong, then you can make small goals for yourself on how to improve your time. But if you just focus on enjoying the training everything else will fall into place. Love reading your running story Julie.I’ve run off and on for a while. I really do love it, probably most favorite work out. I decided to train for a 1/2 marathon, although I haven’t signed up for one I thought it would be fun. I started with Hal Higdon’s plan yesterday. I started witha 5K in College and then jupmed into the Half-M distance my Senior year (3 yrs ago). This Spring I finally ran my first FULL and can definitely say I have no plans to stop running anytime soon 🙂 once you’ve got the race bug, that’s it! Motivation follows…. Loved your story…here is mine. I Tried desperately to love running. Did about 10 5K and a 10K all in 8 months but finally accepted the fact that it wasn’t fo rme. I did not enjoy. That was over a year ago. I hadn’t run outside since my last 5K in March of 09, when for some off reason, a new 5K at the Cowboys Stadium sparked my interest. I signed up just b/c I tought it would be cool and Iwas going to do it only for fun. Well that was 2 weekends ago and aI enjoyed it so much, I ran another race last weekend and have signed up for another in May. Who knows, maybe I can enjoy running! We will see. BTW, the Cowboy Stadium race was AWESOME!!! There is a half marathon too. It’s called America’s Run and they are hoping it becomes a very popular event. So cool. I’m planning on working my way back up to another 10K. I need to go ahead and pick one so that I have a concrete date to work towards. I ran my first half in November, and I’m itching to try another one! Thanks for sharing your running journey! Your story sounds just like mine! Seriously, even down to the timeline and the training website you used. Good job setting goals and completing them. I still have the mantra “just keep running, no matter how slow it is.” In fact, just Sunday on my run I kept repeating it over and over and over…You will do great in June! SIgh, can I still call myself a runner if I have been unable to run since January? I’m hoping (fingers seriously crossed here) to be able to run half marathon in Sept, and if not then then in Nov.
I’m running the Rock ‘n’ Roll Chicago Half Marathon also!!!!!!! Just recently found your blog and have been following for about a week or so – love it!! I supposed I could call myself a runner now! (feels weird saying that!) I did the cross country/track running bit in my late elementary school days, but stopped when high school hit. This past Jan, at 26y/o I decided I wanted to run! 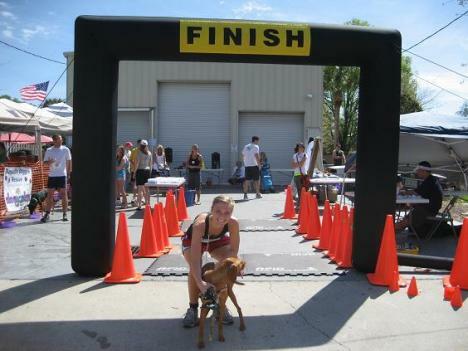 I started by following the C25K (Couch to 5K) program and ran my first 5K race on April 3! it was such an amazing experience – I think I’m hooked! I’ve recently registered for my first 10K in Toronto, ON which will take place May 2!!! I am like you I was never officially a “runner” but on my own I was able to build up to running 5-6 miles a few times a week with no problem. I’m currently still nursing an ankle injury from falling, so outta running shape! I can’t believe that Ryan just ran a 13 mile race without training?! Does he run at all? he plays soccer for a men’s league & gets some running in there, but other than that he’s a weights-only kinda guy. he’s lucky to be so naturally athletic. however, i must say after the half marathon he couldn’t move for like a week! 🙂 i guess training does pay off! LOL, still, that’s pretty impressive he could finish it! I wish I had that natural ability! I remember when running 1 mile was tough! Great story! I love how everyone has a different running story but we all get hooked in one way or another. I’ve been running for the past two years and I love it. The longer race I’ve done is a 10K, but I’ve been looking into half marathons lately…so thats my next big goal! Do you still run nowadays? if yes, how often? if not, why? and when you were training for the half marathon, did you gain/lose weight? did you have problem with period? (i’ve heard that some women lose their period when run long distance). Thanks~ 😉 I’m a new reader and i really enjoy your posts! Since graduating from college in 2006 and leaving my intense cheering days behind, I’ve started running as a new way to challenge myself and hit new goals. Last year I ran a few races, my longest was a Half Marathon, and this year I’ve committed to even more running! Half Marathon 5/2 and a Full in October! I’m nervous but psyched too! I am doing my first half in Florida this March and have just started Hal’s novice plan. Did you feel like it prepared you pretty well? I hve my first 5K tomorrow and my goal is like yours was: just run the whole thing. It’s nice to hear that other people started out slow, but were able to do it! I am a new reader, and I really enjoy your blog! 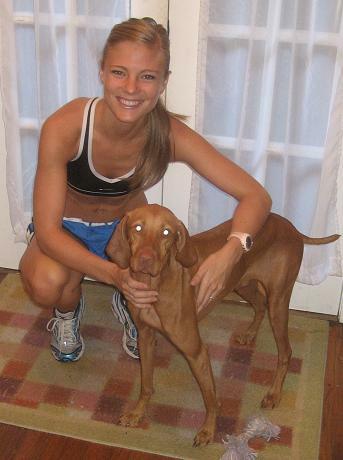 It’s nice to read about other runner’s beginnings! I have never been a runner and will run my first 5k on Saturday. Like you, I just want to be able to run the whole thing! I am then going to start my 10k training. I looked up a training program on Hal Higdon’s website and it looks like he has some great programs. Loved this story! I found your page on Pinterest and love reading your blogs! Yes, reading other people’s running and health blogs does inspire. I am new to running this year. I participated in a relay for the Flying Pig Marathon in Cincinnati and was hooked. Ran a few 5k’s and have been training for the Columbus 1/2 in just 8 weeks. Sadly I fell on my tailbone 10 days ago and I just can’t run right now. I can walk though so that’s what I’m doing. 17 miles in the last 4 days. Praying for a speedy recovery sothat I can make Columbus and prove to myself that I can do it. Keep on blogging and sharing. It’s inspiring! I just love your blog. You make me feel like I am reading a blog of a good friend, super easy to relate to. I love it. I am NOT a runner by any means and also want to run my first half marathon, the Disney half marathon…maybe your story of also not being a natural runner will help give me that extra bit of encouragement to start training my booty into half marathon shape! Hi! I am brand new to the blogging world, and I love your blog 🙂 I will certainly be following! Would you consider checking out mine? Thanks, Happy New Year!